Digital Extremes Partners With Developer Panic Button, Reveals Switch Version at TennoLive. At TennoCon, its third annual Warframe® convention, Canadian developer and publisher Digital Extremes unveiled today Warframe, its hit cooperative online action game, is in development for Nintendo Switch™. Digital Extremes has partnered with developer Panic Button (DOOM, Wolfenstein: The New Colossus, Rocket League) to bring the title to Nintendo Switch. Would you like to see the game in action? 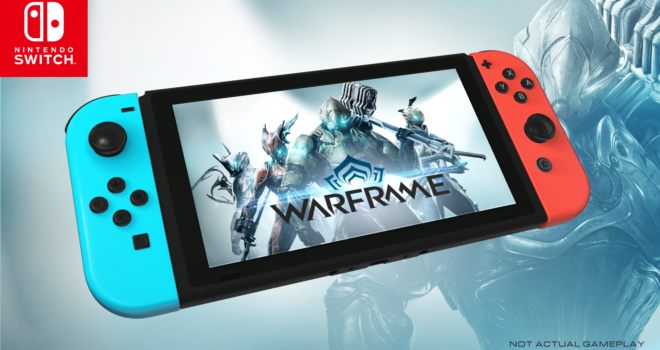 With more than 38 million registered players worldwide, the cooperative, free-to-play hit Warframe is a third-person online action game set in an evolving sci-fi world soon to be available on Nintendo Switch. Warframe gives players the chance to master the Warframe armor as the enigmatic Tenno, a race of ancient warriors wielding blade and gun, who are awakened from centuries of cryo-sleep by the mysterious guide, Lotus, to restore order throughout the Solar System. Warframe features more than 35 unique Warframes, hundreds of weapons and thousands of customization options, the ability to upgrade weapons armor and items using a flexible mod system, and the ability to join clans, nurture pets, and explore massive new open worlds. Bursting with an imaginative terrain and science fiction aesthetic, Fortuna is introduced with a whimsically synchronized musical video guaranteed to surprise and delight! The Venusian landscape packs exciting new gameplay experiences with the introduction of a new faction and lore — the Solaris United faction and its struggle against their Corpus overlords — and an expanded level of vertical gameplay. Starting from the underground Colony of Fortuna where players pick up bounties and missions, Tenno (players’ in-game name) will ascend to the surface of The Orb Vallis to view an exotic new terrain blanketed with Orokin structures, towering mushroom stands, and oceanic flora. Tenno will be able to traverse the landscape more quickly with the Bondi K-Drive, a single-player hoverboard that nimbly jets across the landscape at the touch of a controller. The Orb Vallis, The New Open World — Building on the success of Plains of Eidolon‘s earthen Landscape, The Orb Vallis is Digital Extremes’ massive new Landscape. Volatile, mercurial clouds of blue and orange loom over a sci-fi terrain populated with seascape flora, giant mushrooms, alien rock formations, rare creatures, and more. Solaris United and Fortuna — The cyborg Faction Solaris United live in the Blade-Runner-esque Debt-Internment Colony, Fortuna. Similar to the gathering bazaars of Cetus in Plains of Eidolon, Fortuna is an underground hub city that serves as a factory to clean coolant rivers and doubles as a trading hub for the region. New Combat Experiences — The Corpus occupiers, led by the profit-obsessed Nef Anyo, bring new technology and warriors to bear. Alongside new Corpus ground troop variants, monstrous new Spider Bot enemies of all shapes and sizes will challenge players to face their fears when they explore The Orb Vallis and face-off with the prophet of profit. Ride a Hoverboard — Blaze across the wide open Venusian landscape by piloting the Bondi K-Drive. Call up this handy customizable hoverboard and quickly glide, jump, and trick across a variety of terrain. Join the Conservation Movement — Switch your mindset from blast-happy mercenary to friendly savior. The strange, wonderful animals of the Vallis are going extinct. Explore the new world of Fortuna and apply your new skills to track, lure, and capture them for relocation. Musically — The talented sound team at DE has engineered an alien-tech soundscape of eerie effects and ominous music that set the sonic tone for an incredibly rich experience, and they are joined by renowned sound composer Keith Power who has returned with an upbeat, hum-out-loud musical intro of Fortuna unlike anything you have heard before. Digital Extremes’ newest expansion is part of a grander vision. In addition to the open-world expansion of Fortuna, a separate future update takes Warframe down a totally uncharted path. ‘Codename: Railjack’ will enable 1-4 players to board a warship on land and ascend into space to explore and fight! Players will coordinate responsibilities across the military spacecraft to engage in PvE combat against hostile enemies. The full space experience grants extensive player freedom with options to launch Archwings into space to board, infiltrate and destroy enemy ships during battles. This future update looks to create a cohesive gameplay experience between Warframe‘s open Landscapes, procedurally generated levels, and a new outer-space freedom in a unique sci-fi world. Fly Seamlessly into Space — All new to Warframe, Digital Extremes’ ‘Codename: Railjack’ gives Tenno a trans-planet warship to band together with other friendly Tenno and seamlessly transition from the open Fortuna landscape to space combat! Coordinate Your Space Crew — Pilot the ship and over the whole battle, man a turret, manage the shields, make repairs, and work as a team to capture and conquer other hostile spacecraft. Archwing Attack: Go on the offensive by dispatching Archwings for onboarding attacks. Take out enemy cannons and board enemy ships to confront and eliminate swarming soldiers. Take out their core reactors, eliminate their crew, and emerge victorious! Two New Warframes: Tenno can look forward to Codename ‘Revenant’, an Eidolon-themed Warframe with a deadly affliction, and codename ‘Garuda’, a vicious, gory Warframe that plays with her prey. The New War: Digital Extremes hinted at what to expect in the next chapter of its Cinematic Quest series. Community-driven Creativity: Quick, did you miss it? During the debut of Fortuna, Digital Extremes featured its valued TennoGen partners’ cosmetic creations as part of its ongoing relationship with its community members. Exclusive Amazon Prime Day Bundle: As part of the Amazon Prime Day celebrations, starting July 12, Digital Extremes announced the continuation of its marketing partnership to give away cool Warframe stuff featuring an exclusive Liset Skin and an exclusive Color Picker (must be Twitch Prime members to claim). For Our Community: Following its tradition to support and contribute to its local community, Digital Extremes donated $200,000 CAD to this year’s charity partner, Canada Learning Code, which teaches digital skills to women, girls, people with disabilities, indigenous youth, and newcomers. For more information on Canada Learning Code’s education vision and programs, head to www.canadalearningcode.ca/. Marlon Reid, thanks! And thanks for sharing your great posts every week! This is an excellent motivating content. i’m fairly abundant proud of your work. you place extremely terribly details. Keep it up.